I have never made chicken and biscuits before. To be fair, I think I’ve only eaten it twice before. But for some reason, I decided that’s what I was going to make us for dinner the other night. We made that crockpot chicken and so it made sense to make something special with all the meat. I even had the juices from the chicken left over so I could make gravy. Peas in the freezer? There’s our veggies! So I took a whirl and ended up with a pretty yummy (and super quick) meal. In a saucepan, heat the three tablespoons of chicken drippings on medium-high heat. Add flour and stir until flour thickens. Continue stirring and slowly add water and remaining chicken drippings. Add black pepper. 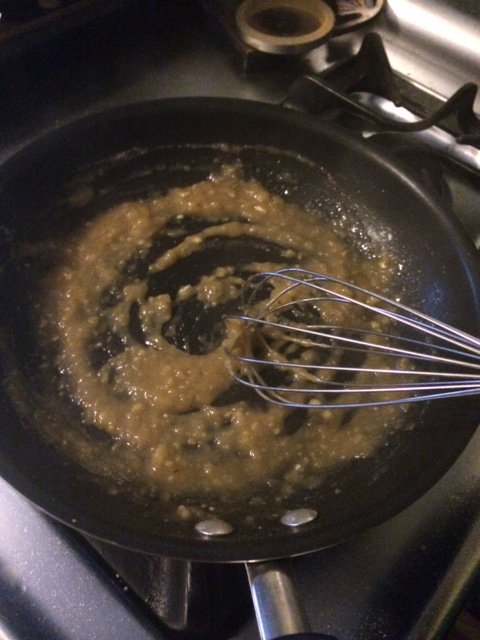 Stir until you have the consistency you like, but should take about 5 to 7 minutes. Add peas and stir until warmed. On a plate place sliced open biscuit. Top with some shredded chicken and then with the gravy and peas sauce.